40″ square. Wool batting. Liberty Lawn back. Yum. It weighs nothing. It is the perfect baby quilt. Hand quilted with Aurifil floss and linen thread. I’m teaching it as a hand applique/big stitch hand quilting class in September but it’s kind of easy-peasy. I thought you might be interested in how I put it together. 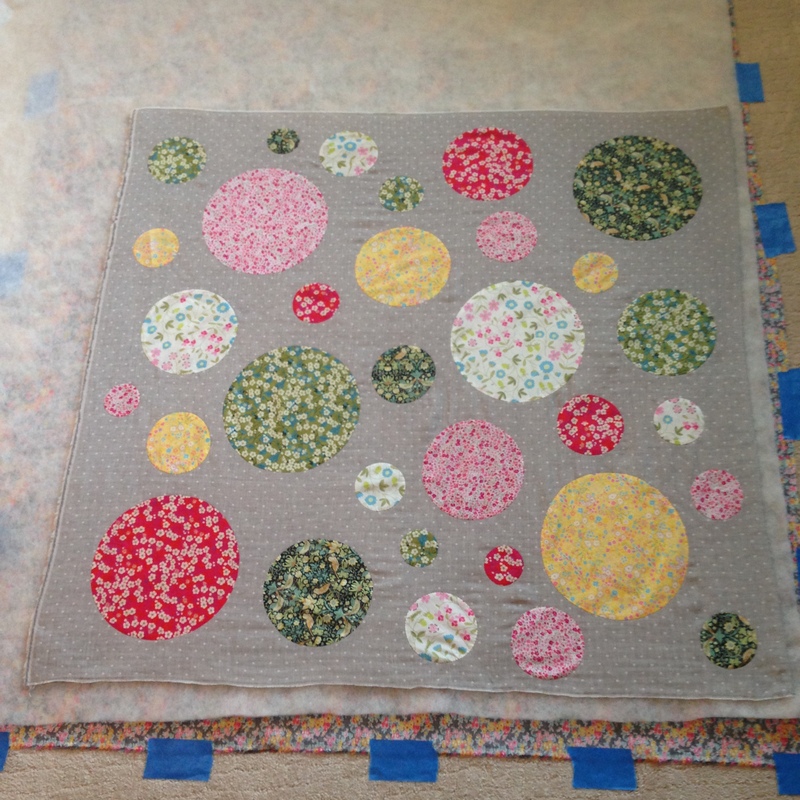 First I trimmed my double gauze to 40″ square and stay stitched the edges because the double gauze ravels badly. 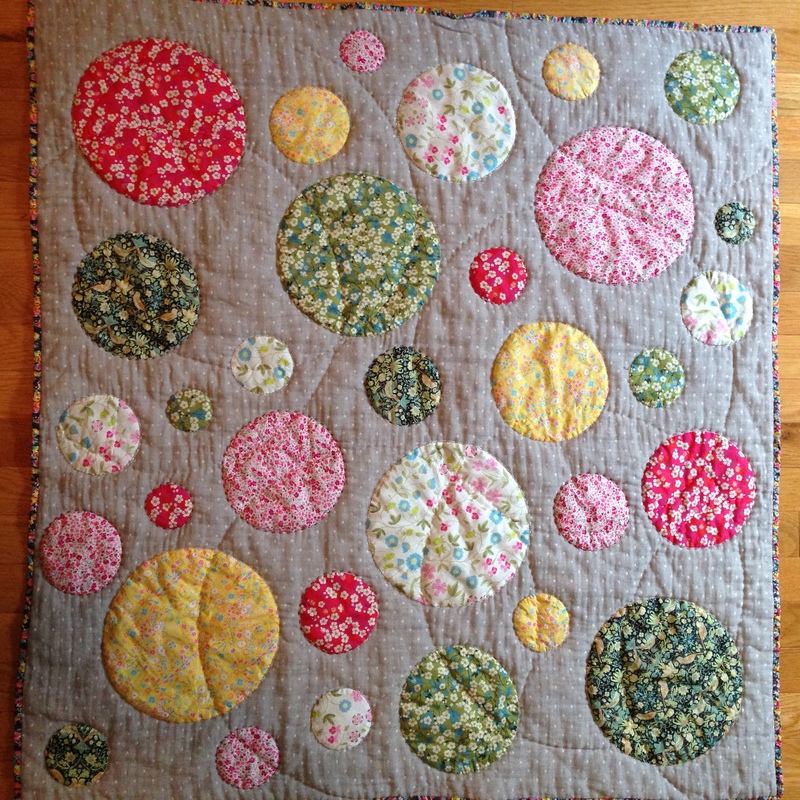 I appliqued six different big circles (about 9″) to the background. 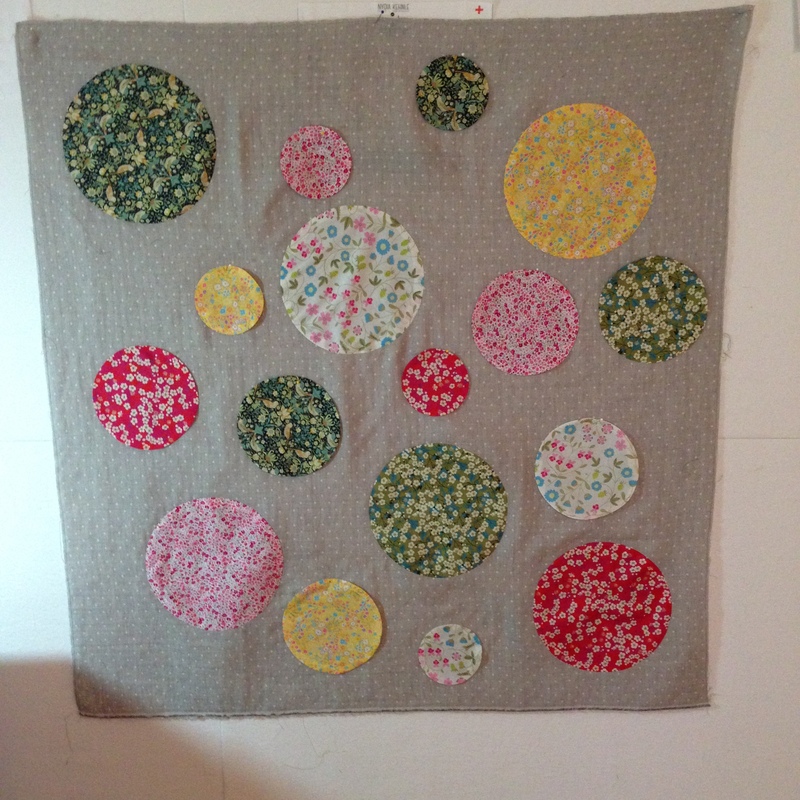 I used templar plastic for applique (thanks Debbie G) to make my circles. Freezer paper will work. Raw edge fused will work. I just wanted to preserve the softness of the fabrics. Of course I needed more circles. 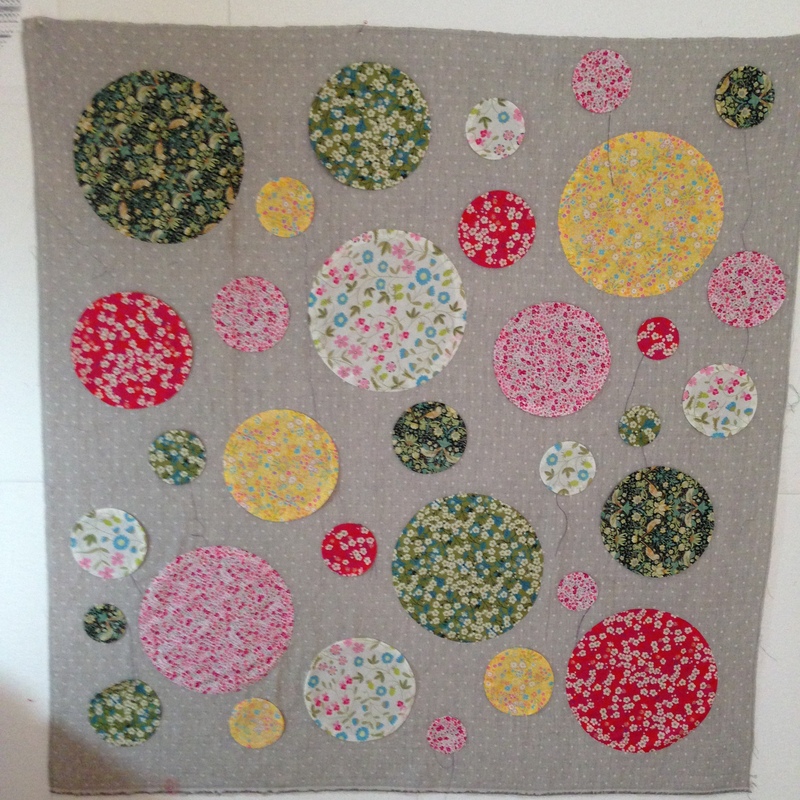 I used Karen Kay Buckley’s Bigger Perfect Circles for the smaller sizes. hand appliqued them. That was fun; the fabrics are so wonderfully thin and soft. I cut away the background under the circles. That was scary but I liked the effect. The gray double gauze caused a shadow. Cutting it away allowed the Liberty colors to be true. This next part was not so fun. I taped my Liberty Lawn backing to the floor. I used a wool batting from Trailer Stash. It has loft but no weight. Not too poofy; just right. I used A LOT of safety pins to baste it. I hand quilted it and I did NOT use a hoop. I have been to a couple of classes where the teachers pin basted and did not use a hoop and I have seen my own students do it. Yes, you can teach an old dog new tricks. 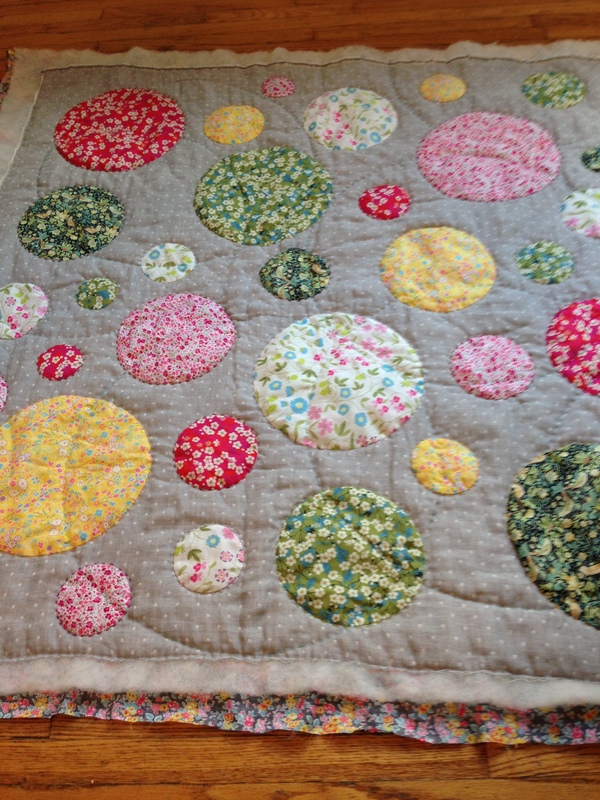 It worked nicely because the quilt was poofy and full. I used Aurifil floss because Gina had it in the shop. I liked it because it comes on cute wooden spools. I used four strands. 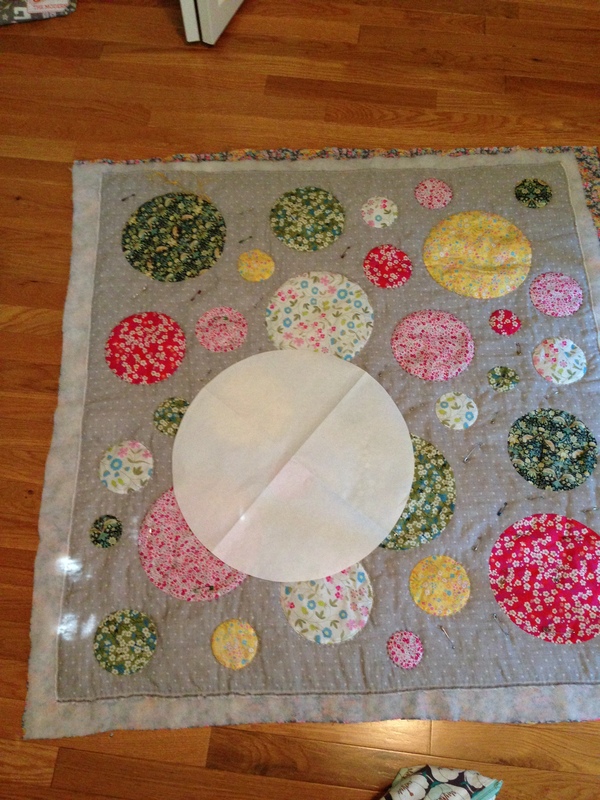 When I finished quilting all the circles, I thought the big circles were too poofy and needed some more quilting. I cut a BIG freezer paper circle and randomly traced the shape on the quilt with a blue water soluble marker. Thanks to Jennifer M for that idea. She’s in a Monday night stitching group that I attend. You should come. 🙂 I hand quilted those circles during a road trip to Nashville, TN to see Larry. 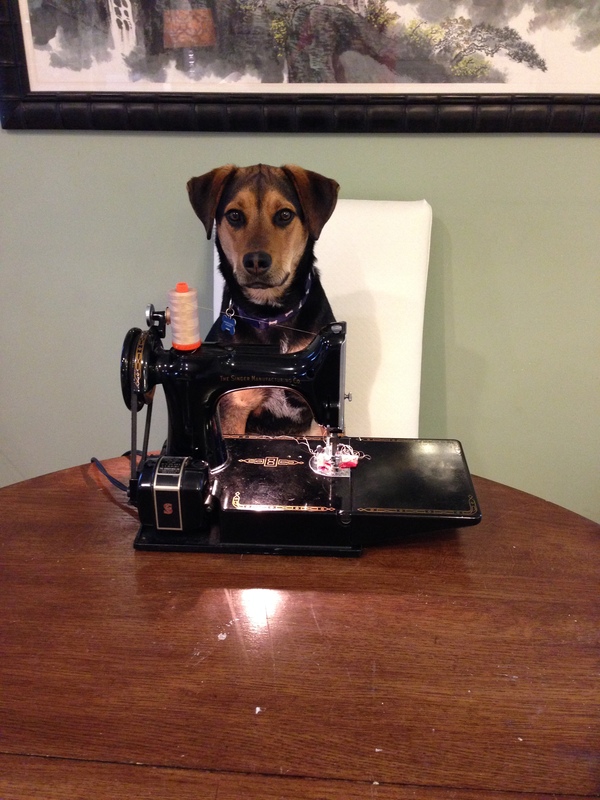 He likes to help me sew. I used Normandy linen thread because I wanted the background quilting to blend. I really liked the results. I finished it and then hand stitched a running stitch around the outside of the quilt. I trimmed it and bound it with leftovers from the back. I washed it in Soak and air dryed it. If you are local, you should go by Trailer Stash just to squeeze it. I really like it. Gina has kits, including the wool batting and it will be there for the September Shop Hop. 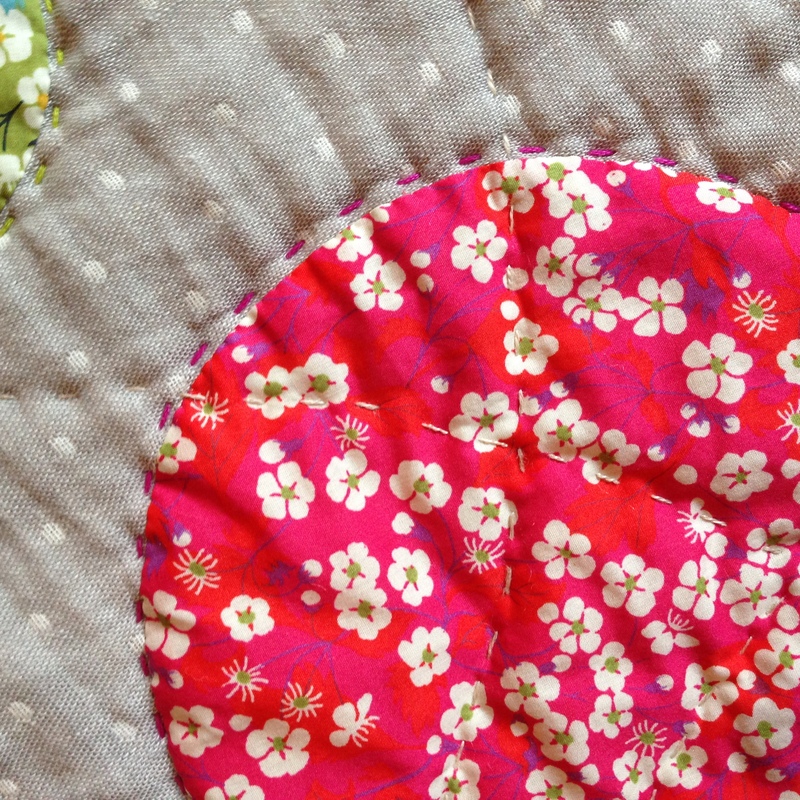 I’ll teach the hand applique in September and the big stitch hand quilting in October if you want to join me. My classes are listed on my class schedule page. Let me know if you have questions about the process! 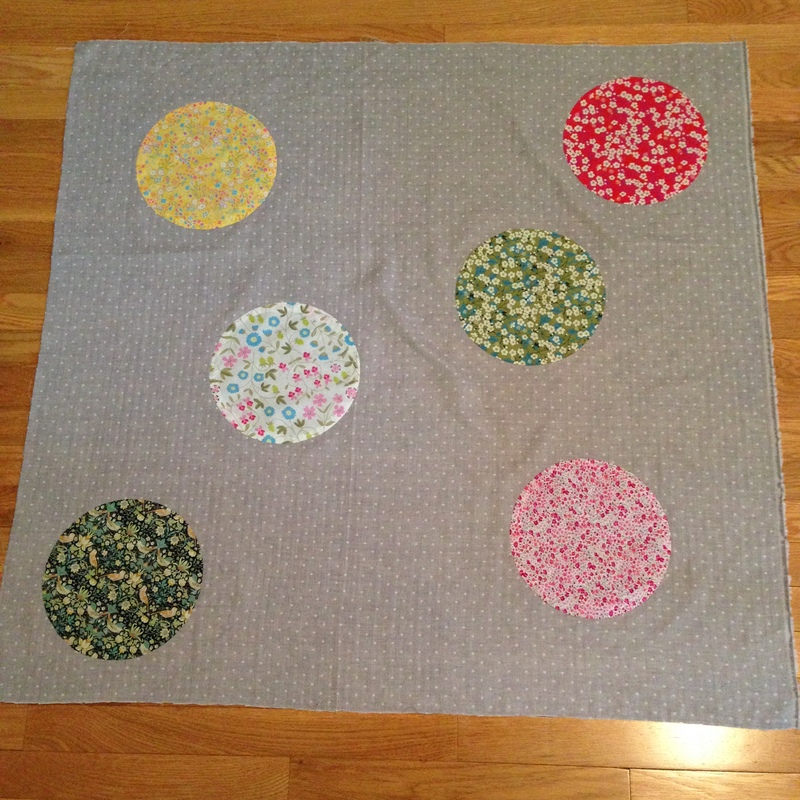 This entry was posted in Uncategorized and tagged Aurifil floss, hand applique, Liberty Lawn, Trailer Stash Fabrics on August 19, 2015 by kathleenbaden. Thanks Deb! I do love this one. See you soon! 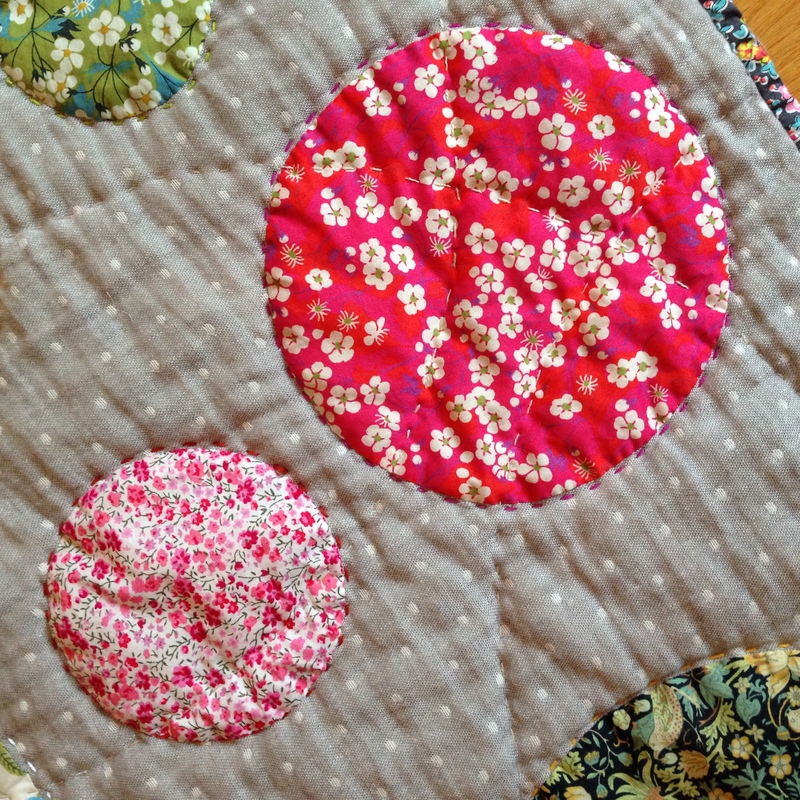 Beautiful quilt Kathleen. It’s simply a cutie ……can’t wait to take your class for this one. Continue to inspire us. Thanks for the kind words Bev! See you soon.